The leaves are entire, that is they are not divided but might be described as arrow shaped. The leaf margin is smooth - not toothed. 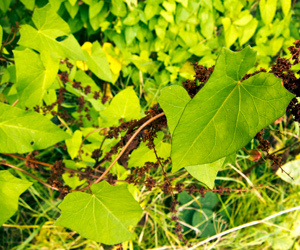 The leaves and stems are hairless (though the hairy bindweed does, as its name suggests, have hairy stems). The leaves have prominent stalks (petioles) and the main veins of the leaf are quite noticeable. The flowers are generally large and trumpet shaped. Generally they are white - though occasionally white / pink stripes are seen. 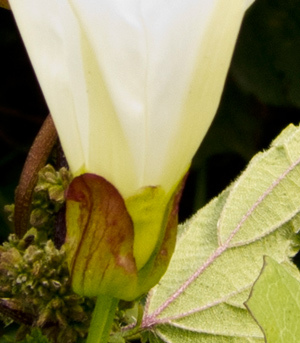 Beneath the trumpet, there are five blunt sepals - five lobes are usually visible. Bindweeds are perennial plants that 'climb over' other plants. The field bindweed (Convolvolus arvensis) is a weed of gardens, climbing fences and other structures - producing white / pink flowers (up to an inch in diameter), which have a pair of tiny bracts on the stalk below the flower. It is difficult to eradicate as its roots penetrate deep into the soil. 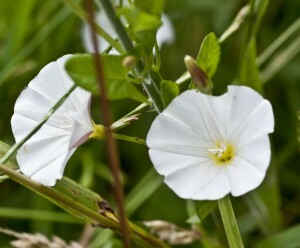 The hedge bindweed and the large bindweed (Calystegia species) are vigorous hedgerow species, but may also be found on the edges of woodlands. Both usually produce white flowers, though occasionally pink / white flowers are seen. 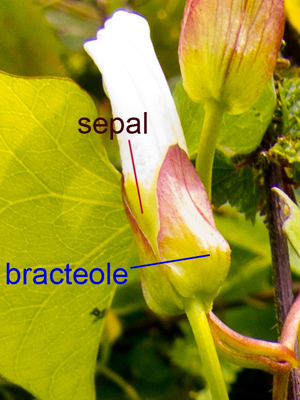 In the hedge bindweed, the flowers are up to 2.5 inches / 60 mm in dismeter; the five sepals beneath the trumpet are 'half covered' by two large bracteoles- which often have a purple tinge. 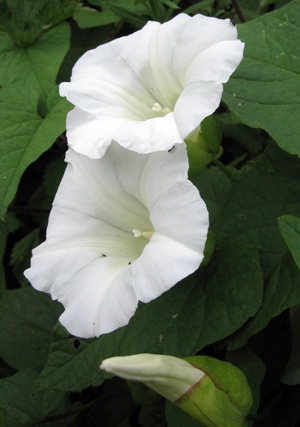 The large bindweed has flowers up to 90 mm / 3 inches in diameter, with bracts that covers / encloses the sepals.